Important Note : Figures show only merchandise imports excluding imports of services. Al data gathered from International Trade Statistics 2013 published by WTO (World Trade Organization). India is the 10th biggest importing country in year 2012 with its imports amount reached to 490 billion USD dollars. 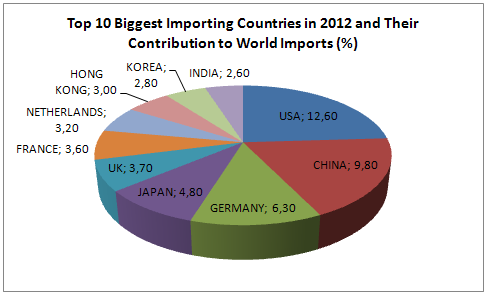 India’s imports are forming 2,6% of global imports in year 2012. India experienced a significant 5% increase on its imports in year 2012. Major Import Partners: China (12%), United Arab Emirates (8%), United States (5%), Australia (5%), Saudi Arabia (5%). Republic of Korea is the 9th biggest importing country in year 2012 with its imports amount reached to 520 billion USD dollars. Republic of Korea’s imports are forming 2,8% of global imports in year 2012. Republic of Korea experienced a 1% decrease on its imports in year 2012. Major imports: Petroleum oils, crude (7%), Electronic integrated circuits (7%), Petroleum oils, refined (4%), Machines and mechanical appliances having individual functions (4%), Petroleum gases (4%). Major Import Partners: China (20%), Japan (18%), United States (10%), Australia (6%), Indonesia (4%). Hong Kong is the 8th biggest importing country in year 2012 with its imports amount reached to 553 billion USD dollars. Hong Kong’s imports are forming 3,0% of global imports in year 2012. Hong Kong experienced a 8% increase on its imports in year 2012. 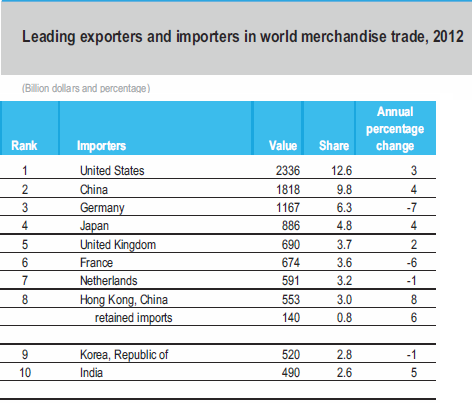 Major Import Partners: China (45%), Japan (9%), Singapore (7%), Asia NES (7%), United States (5%). Netherlands is the 7th biggest importing country in year 2012 with its imports amount reached to 591 billion USD dollars. Netherlands’s imports are forming 3,2% of global imports in year 2012. Netherlands experienced a 1% decrease on its imports in year 2012. Major imports: Petroleum oils, refined (9%), Petroleum oils, crude (5%), Automatic data processing machines (5%), Medicaments, packaged (3%), Cars (3%). Major Import Partners: Germany (16%), China (10%), Belgium-Luxembourg (10%), United States (7%), United Kingdom (6%). France is the 6th biggest importing country in year 2012 with imports total reached to 674 billion USD dollars. France’s imports constitute around 3,6% of total global exports in year 2012. France is a member of European Union. Along with most of the EU members, France experienced a decrease on its import in year 2012 which is around 6% comparing to year 2011. Major imports: Cars (5%), Petroleum oils, crude (5%), Petroleum oils, refined (4%), Petroleum gases (3%), Medicaments, packaged (3%). Major Import Partners: Germany (18%), Belgium-Luxembourg (9%), Italy (8%), China (8%), Spain (7%). United Kingdom is the 5th biggest importing country in year 2012 with its imports amount reached to 690 billion USD dollars. United Kingdom’s imports are forming 3,7% of global imports in year 2012. United Kingdom experienced a 2% increase on its imports in year 2012. Japan is the 4th biggest importing country in year 2012 with imports total reached to 886 billion USD dollars. Japan’s imports constitute around 4,8% of total global imports in year 2012. Japan imports significantly increased in year 2012 which is around 4% comparing to 2011 imports. Germany is the 3th biggest importing country in year 2012 with imports total reached to 1.167 billion USD dollars. Germany’s imports constitute around 6,3% of total global imports in year 2012. Germany is a member of European Union. Along with most of the EU members, Germany experienced a decrease on its import in year 2012 which is around 7% comparing to year 2011. China is the 2nd importing country in year 2012 with imports total reached to 1.818 billion USD dollars. China’s imports constitute around 9,8% of total global imports in year 2012. China imports significantly increased in year 2012 which is around 4% comparing to 2011 imports. USA is the biggest importing country in year 2012 with imports total reached to 2.336 billion USD dollars. USA’s imports constitute around 12,6% of total global exports in year 2012. USA imports significantly increased in year 2012 which is around 3% comparing to 2011 imports.